I was a non-believer before this cereal. For years the idea of consuming anything beyond coffee before 10AM was downright repulsive and I saw no reason to aimlessly stuff food down my gullet without seriously enjoying it. On the weekends, brunch was a civilized concept that I could wrap my brain around: a well presented tasty meal, designed for leisurely pleasure. Now we’re talking. When my schedule shifted and I needed high energy and all the smarts I could muster first thing in the morning― with little hope for food until late afternoon― I knew I had to adjust my eating habits. For a while I relied on homemade breakfast bars. Although that wasn’t enough to make it until 3PM or later, it did get my stomach programmed to tolerate early AM food. I considered a lot of breakfast options and kept returning to a cereal of some sort―more out of convenience, but I wasn’t happy. Ready-made cereal was out of the question, and most cooked cereals were heavy and uninteresting. I needed food with staying power. 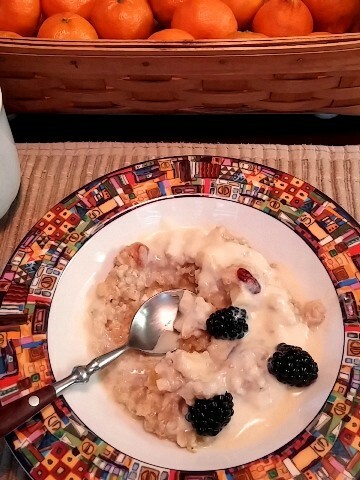 I liked muesli, the European cereal with whole grains that are soaked, perhaps toasted, but not cooked. It’s probably the precursor to granola, but sadly most granola sinks into a disappointing sugar/fat saturated imitation of the real thing. So this is the point where original muesli and I parted ways. I opted for a similar ingredient profile, but headed toward a cooked version that would provide some of the enticing creaminess I yearned for. I love oats, so they would serve as my base. I continued to tinker. Over time, I hammered out what worked for me and developed a simple method to bring it all together. My local market’s bulk food section became a regular hangout. My standard grain combination is based on a good quality oat multi-grain blend―essentially 5 grains featuring rolled oats, flaxseed, rye, barley, triticale and whole wheat. 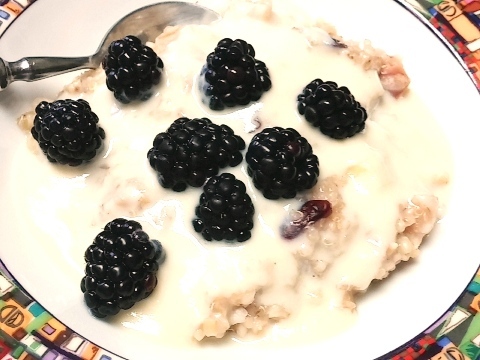 I beef that up further with my own five grains: equal amounts of steel-cut oats to reinforce the oats, bulghur wheat, and buckwheat groats―for their nutty, musky, flavor. (I learned that buckwheat is unrelated to wheat, and even more nutritious; it is a great substitute for those who are gluten intolerant). Finally, millet is included for the creaminess component, I discovered mild-mannered millet has great binding qualities when thoroughly cooked. Dried fruit is a regular in my muesli; golden raisins are a superb addition for their natural sweetness. Other favorites: dried cranberries, apricots, and even prunes (dried plums). On occasion, I cut up an apple with skin on and add it with the dried fruit at the end of cooking. There’s no getting around it, cooking whole grains takes time, but I have learned I can make up a big pot once a week. I have an electric kettle that I fire up with plenty of water. In a 2-3 quart pot I heat 3-4 cups salted boiling water. The grains are divided into 2 groups, the first batch cooks for about 20 minutes, with a couple more cups water added to thin. The 5-grain oats are added and cooked for an additional 10-15 minutes. Then, the dried fruit, perhaps an apple, plus a bit of cinnamon or other sweet spice are stirred in, they continue to cook until the fruit is softened, another minutes. As the cereal cooks I stir in more hot water to thin as needed since the cereal continues to thicken as it cools. In all, I allow about 30 to 40 minutes total cooking time. A batch will store for up to a week in a sealed container in the fridge. In the morning, I spoon the day’s portion into a microwaveable bowl. When ready, I pop it into the microwave and heat until it is piping hot, about 2 minutes, and top it with a large dollop of plain yogurt and a spoonful of marmalade, jam, honey or agave. For a very special treat, it is delicious topped with homemade Custard Sauce and perhaps a few fresh berries. I have to finally admit it, cereal really can be a great way to start the day. I am no longer threatened by those extreme highs and lows, I can remain focused, my appetite stays in check, and I get the job done without becoming completely frazzled. It’s all built on a breakfast of champions. Named after the European cereal of soaked or toasted whole grains, my cooked version is still full of fiber and texture, but its creaminess adds another satisfying dimension. Consider other grains like barley, triticale, quinoa, etc. It can be stored well covered in the refrigerator for several days. In 2-3 qt pot, bring 3 cups salted water to a boil. 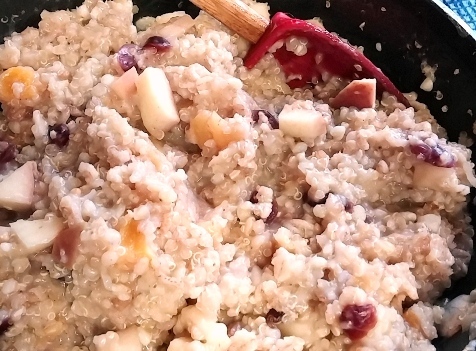 Stir in the steel-cut oats, bughur wheat, buckwheat groats, and millet. Bring to a boil, reduce heat, and simmer 20 minutes. Add 1-2 cups hot water to thin as it thickens. Stir in the 5-grain oat blend and cook an additional 10-15 minutes; add hot water if it becomes too thick. Stir in the dried fruit, apple and spice and simmer another 5 minutes to soften the fruit.